It’s a Birthday Party…..For a Party Game! Kensington, MD (August 3, 2018) – North Star Games’ hit party game Say Anything is celebrating a milestone rarely achieved in the party game market – 10 years of sales! Since its initial release in 2008, the game has sold almost 1 million copies and won several prestigious Party Game of the Year awards, including those from fans at the Origins Game Fair and the BoardGameGeek.com. 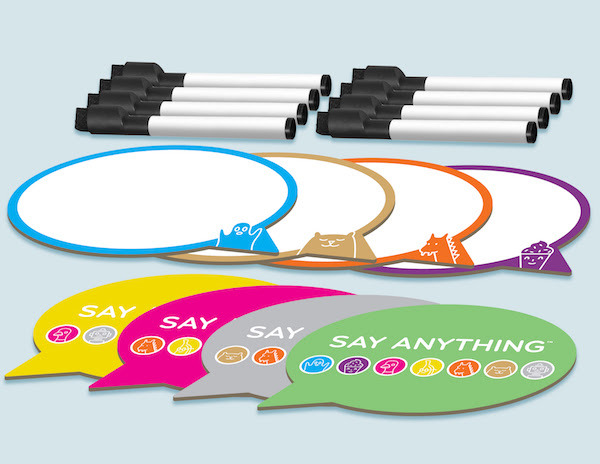 In celebration, North Star Games is partnering with Target to launch a special Say Anything 10th Anniversary Edition. This special edition includes updated components, refreshed graphics, and 180 new questions for you to answer as ridiculously as possible. When originally released, Say Anything offered a breath of fresh air to the stale party game market. Many party games came with pre-printed cards that players submitted as answers to questions. Say Anything broke new ground in the genre by allowing players to answer questions in their own words. Say Anything 10th Anniversary Edition is now available exclusively at Target Stores and Target.com for $19.99. Through August 11th, customers can get 10% off Say Anything 10th Anniversary Edition here, using the promo code: GENCON. Ages: 13+; Players: 4 – 8; Play Time: 30 minutes; MSRP: $19.99. Augustus seems like the shoo-in for the SDJ this year, if only because of its box-size. The other contenders, including the amazingly fun Hanabi and the reasonably fun Qwixx, are just too small for the traditional prize. They’ve never given the award to a game in such a small box. But Augustus already has the traditional split from the Gamerati – with half of them calling it a lot of fun and the other half saying it is too light and “Gamer Bingo”. I’m trying to acquire a copy for my upcoming Friendcation, where I go to a resort and play games with some of the oldest friends (Hanabi and Qwixx are already packed) so we can get our own assessment. See below to get the opinion of the Grand Poobah of Gaming himself, Mr. Greg Schloesser. Augustu s from designers Paolo Mori & Vincent Dutrait has quickly gained the moniker “Caesar Bingo,” and it does, indeed, fit. But please don’t let that deter you from playing, as there is much more here than the traditional game of Bingo. Like all game design, it’s about knowing your audience.